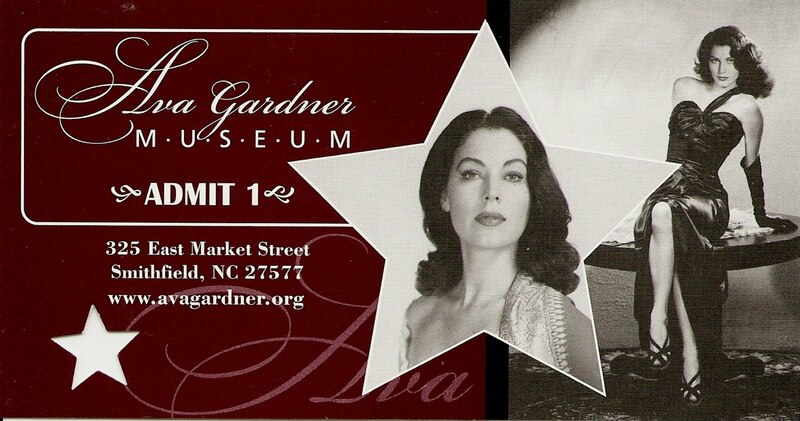 Rooftop Reviews: The Ava Gardner Museum - Smithfield, N.C.
Sue and I took a long drive yesterday, about 150 miles each way in the pouring rain, to see this low key, non-descript tribute to one of Hollywoods most enduring legends. 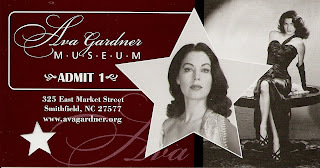 The museum is actually a converted store front on Main Street in Smithfield, a few miles from where Ms. Gardner was born in Grabtown, which was nothing more than an intersection at the time, and still is today. That she is buried about one mile out of town is even more amazing than her life, which took her all around the world, until, like Dorothy in "The Wizard of Oz", she finally comes back home. The exhibits range from a very informative 18 minute film of her life, to display cases which highlight everything from her clothes to personal items. There are letters from Vincent Price and Mickey Rooney, the watch she gave her friend Ernest Hemingway, and lots of her own things from her apartment in London, where she spent her last years, after a long time living in Spain. Born in 1922 in Smithfield, she spent some of her early years watching movies at the local theater, The Howell, which still operates today. It was there that she saw Clark Gable in "Red Dust", the 1932 movie she would someday remake with Gable retitled "Mogamba." She remarked, of this film, that it was like a dream come true. Her career began early, at age 18, when someone noticed her and approached her boss,(she was working as a secretary in Smithfield) in an effort to gain her name and phone number. He claimed to have connections with MGM and could get her a screen test, which was the dream of every young woman at the time. Her boss, acting in a shrewd and protective manner, had some photos taken which he then presented to MGM in New York. A screentest was arranged and the rest is history. Within 2 years she would wed Mickey Rooney, that lasted 2 years. From there she moved on to band leader and clarinetist Artie Shaw. That marriage lasted only about one year, due in large part to the attentions being lavished upon her by Howard Hughes, who was paying for Ms. Gardner's mothers health care. In 1951 she married Frank Sinatra, who was in the midst of a career downturn, just as she was on the upswing. Her sucess in the musical "Showboat" had made her one of the hottest actresses of the time. The two quarrelled constantly, and though they were the true loves in one anothers lives, the marriage didn't last. When she went to Spain to make "The Barefoot Contessa" with Humphrey Bogart, she fell in love with the country. Within 2 years she would move there in an effort to distance herself from Hollywood and Sinatra. But their love for one another would never really fade away. During this period she became lifelong friends with the poet Robert Graves. His notes and letters to her are part of the exhibit. Her circle of friends was largely composed of people not in the Hollywood "loop." Gregory Peck, one of her favorite co-stars, is represented in the collection through some of his letters to her, which are on display. Although her last years were spent in London, where she was truly happy, her longstanding desire was to be buried next to her parents in Smithfield. When she passed away in 1990, her wish was honored and she came home to rest alongside them, only a mile down the road from the museum which houses some of the things she loved most.